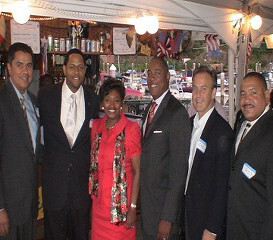 Bridging the gaps between corporate America and the Hispanic businesses and individuals of Westchester! WHCC was once a dream that resided in the minds of few. With the drive to make a change in the county, we moved forward, persevered and it is our efforts that have brought WHCC the success it enjoys today! As we celebrate the Westchester Hispanic Chamber of Commerce’s (WHCC) 30th anniversary, I am excited to announce our renewed commitment towards our goals. 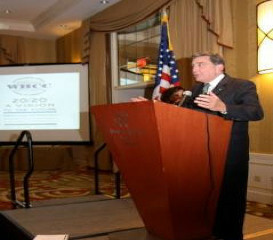 We strive to promote and work for the advancement, and economic development of Hispanic businesses. We also concentrate on the needs and wants of Hispanic professionals in our county, working closely with them to gradually inch them towards their dreams of success. When a committed group of business professionals realized the tribulations that hindered the success of Hispanic businesses and individuals, they decided to take a stand and work towards a common goal: development of Hispanic businesses and professionals. Keeping this goal in mind, the WHCC was established in 1988 in response to the pressing need to create an organization that would respond to the various needs of the growing Hispanic business community. Over the years, the Chamber has evolved into a vehicle that serves as our voice before government entities, to bring about the change that can benefit our businesses. The dedicated team at the WHCC provides numerous benefits to Hispanic businesses and professionals with focused educational forums, networking events, workshops, round-table discussions, procurement matchmaking, and meal events that feature premier keynote speakers. WHCC also provides members access to Corporate and Government agencies that support Hispanic business development and stimulate growth. Our defined goals are to increase business opportunities for our members and to foster an environment of economic growth. All our efforts result in job creation, empowering our Hispanic community to level up their lifestyle. We believe that with the dramatic growth of the Hispanic population in our region, and the establishment of a large number of businesses, new challenges have arisen. These obstacles have pronounced the need for a stronger business organization that will be able to address these new challenges. In order to find ways to make these changes work for the benefit of our Hispanics community, the WHCC has established a strategic alliance with the Westchester County Association. This mutually beneficial partnership allows us to utilize effective marketing techniques that will eventually help us make an impact on the market as a whole. With the help of Westchester County Association, we aggressively enlist the support of our vast regional business community through member recruitment, and design programs that deliver vital services to our members and community at large. The WHCC membership consists of Hispanic businesses, professionals, as well as private and public institutions interested in doing business with the growing Hispanic market. We are committed to facilitating business relationships between our members and the business community, empowering them. On behalf of the Board of Directors, and the membership of WHCC, I encourage you to join us and support this endeavor.